The following children were chosen as Students of the Month at Lynchburg-Clay Elementary for April. The students were chosen by their teacher for displaying positive behavior, being responsible and respectful, doing good deeds as well as their school work, and for being a positive role model for others. Pictured are (front row, l-r) Tiergan Bowman (PK), Zion Bailey(K), Madison Berwanger (K), Macey Green (K), Everett Van Fleet (K), Adrian Ekhator (1), Conner Willey (1), Callie Watson (1), Lola Penza (1), and Michael Osborn (1). 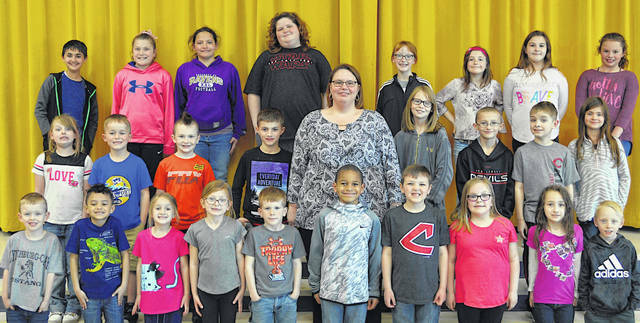 (second row, l-r) Lyza Sloan (2), Sheridan Howland (2), Jason Butler (2), Blake Walters (2), Principal Mrs. Angela Godby, Joanna Knope (3), Jayden Peters (3), Austen Campbell (3) and Allison McQuitty (3). (third row, l-r) Iden Hejazifar (5), Allysen Knisley (5), Shyenne Cook (5), Diamond Hewitt (5), Caraline West (4), Rosemary Holaday (4), Bree-Ann Hollingsworth (4) and Lily Doughman (4). Absent from the picture are Aaliyah Broyles (PK) and Zoey Taylor (2).